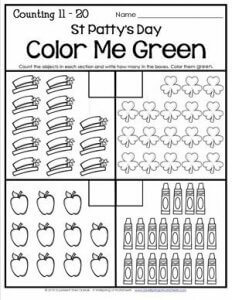 Green is the color for St Patrick’s Day so why not have a worksheet for things that are green? Kids count the objects, write how many in the boxes, and color everything green. You might to be sure to have plenty of green crayons. More than one shade might be nice, too.